In an historic first for the club (we think!) 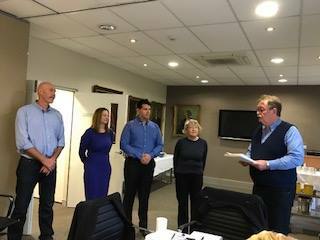 Manly Rotary inducted Ty Stokoe, Sherry Midgley, Daniel Boothman and Robyn Waters as our newest Rotarians. President Richard gave a brief history of the club and explained that our newest members were now “bonded together with “people of goodwill”and he encouraged them to participate in serving the local, national and international community. Assistant District Governor Warren McGurgan also spoke, referring to the vibrancy of Manly Rotary. Each new member indicated a willingness to serve and be part of a greater community.